If you're already familiar with the world of Guild Wars 2, you can skip this post and go straight to the discussion or check on the official VGChartz guild in the game. For those who aren't familiar with Guild Wars 2 however, these next few posts will provide everything you need to get started! Guild Wars 2 is the highly anticicpated sequel to the original Guild Wars games, Prophecies, Factions and Nightfall, as well as the expansion pack, Eye of the North, all developed by ArenaNet and published by NCSoft. Guild Wars 2 is a fully fledged MMORPG, seeking to bring innovation to the genre in several different ways, on top of keeping with many of the ideas from the original games. ArenaNet have already created a video manifesto that will explain some of what they're doing and why it's different from the industry standards. It's a very nice way of getting an overview of some parts of the game, while getting a look at a bunch of in game footage. I'll describe the same elements as the video does here, and continue with the elements not described in the video afterwards. So if you want this information in text (and with more details), you can keep reading, otherwise I recommend skipping ahead to the manifesto video. 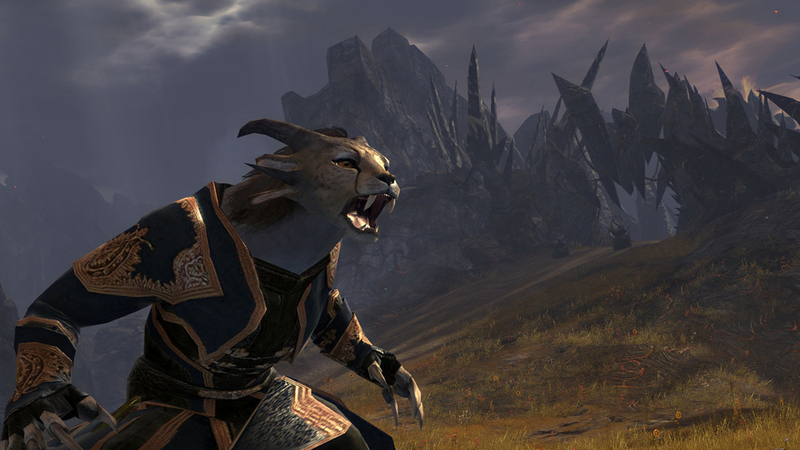 Now, like the original Guild Wars games, Guild Wars 2 does not have a monthly subscription fee. When you buy the game, it's yours to play as much as you wish regardless of what you payed for it and how much you intend to pay in the future. 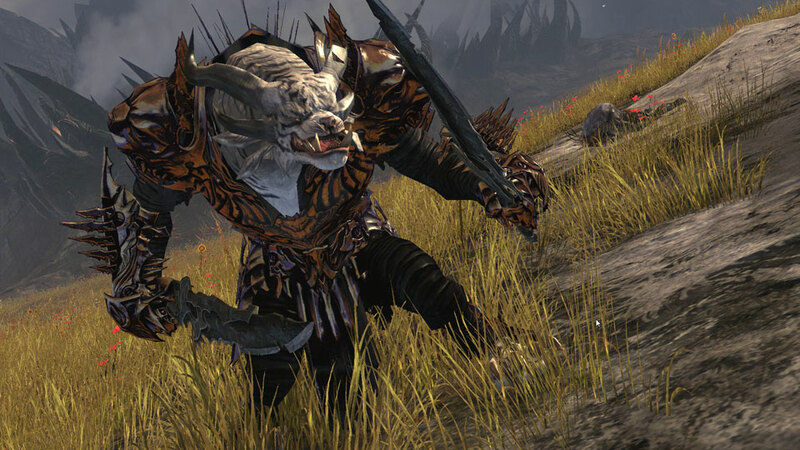 The game will feature DLC and micro transactions, but ArenaNet have assured fans that there won't be items for sale that can give some players an advantage over other players. 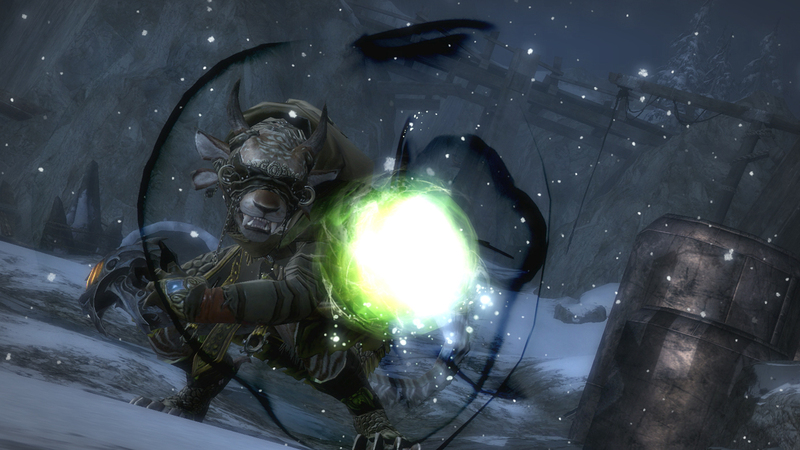 The gameplay is where Guild Wars 2 wants to change MMORPGs most of all however. ArenaNet are touting several key elements as the elements that will set Guild Wars 2 apart from the competition more than anything else. The first of these elements is the dynamic event system. What are dynamic events you say? They're what's replacing the traditional quests in Guild Wars 2! For a long time, MMORPGs have been using a quest model, where everyone is questing for themselves, and dynamic events are here to change that by making the quests happen around you. Normally in MMORPGs, you would ask an NPC for a quest, get some objectives, complete them and return for your reward, but that doesn't make sense in a world inhabited by thousands of players. Every player will get a quest to save some village, and that exact village will have been saved from the exact same enemy millions of times over the years. Dynamic events change that, because now you can visit that village many times without anything happening in it, but all of a sudden it might be attacked by a group of bandits. And this is something every player in the area sees. There's no NPC with an exclamation point over their heads, this group of bandits just attack and you can either choose to try and save the village or ignore it and be on your way. If the bandits manage to take over the village, that village will stay under bandit control until it is liberated by players. Then the players might see a new event about destroying the bandits' camp, which could be the next event in the event chain. If the camp is destroyed, the bandits won't be back for a long time, but if the camp is not destroyed, they might launch another attack on the village soon. Now, if you're familiar with MMOs, that might sound like what Warhammer Online and Rift have been doing, and they do indeed have much in common. The difference with Guild Wars 2 is that every quest that isn't directly related to your personal story, which I'll get back to, is a dynamic event, where in Rift and Warhammer Online only a small selection of content works this way. The next element ArenaNet is touting is the personal storyline. But what about Star Wars: The Old Republic, didn't it already put the stories of MMORPGs on par with those we know from offline RPGs? It certainly was a big improvement over what we've been used to, so the personal storyline in Guild Wars 2 shouldn't be anything revolutionary, but a worthy inclusion none the less. Guild Wars 2 does however take a different approach to storytelling than The Old Republic does. In Guild Wars 2, everything that is related to your personal storyline is contained in instanced areas, and you will be making decisions that affect how those areas are changed. 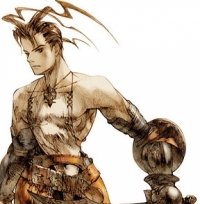 When you create a new character, you are asked to fill out a few questions about the background of your character, that will have meaningful impact on the story, and you will also continue to make interesting choices throughout the game. This means your actions in the story will have permanent effects, but these will only be visible to other players if you invite them along. If you've been reading along this far, the manifesto below won't hold much new information for you, but it's a good watch none the less. But feel free to skip it. Be aware that this video is from 2010, so nothing in it is final! Still following? Good! Let's move on to the active combat! 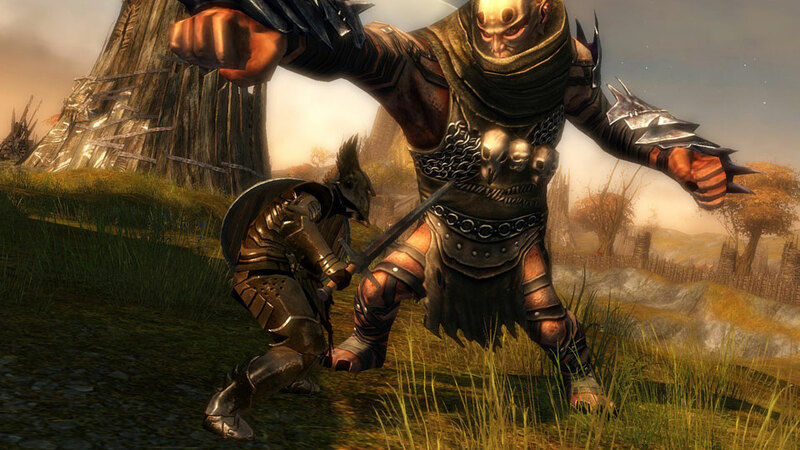 ArenaNet wishes to revolutionize MMORPG combat and break away from the mold that most MMORPGs are keen to sit in, where combat can be very static and everyone have predefined roles. 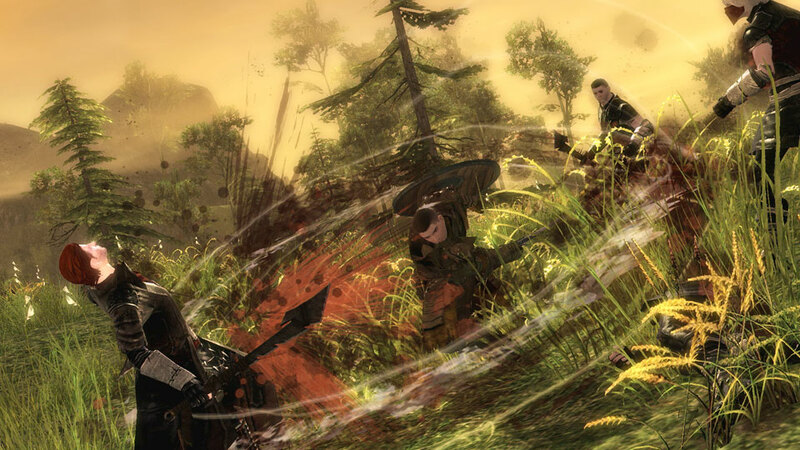 In Guild Wars 2, positioning and flexibility is of the utmost importance, which is why everyone can make dodge rolls and everyone can revive eachother, with no need for skills that perform these actions. You have ten skill slots available to put skills into, but the first five skills are decided by what weapons you choose to wield at any point. For example, a warrior wielding a two handed mace will have all five skills defined by the mace, but if he changes to a sword and shield, the sword decides his first three skills and the shield decides the other two. This gives the professions in the game great flexibility, because a necromancer can change weapons and go from being a support oriented character to a front line character in the blink of an eye, which also brings with it the death of the "holy trinity" of MMORPGs: The tank, the healer and the DPS. Guild Wars 2 has no dedicated healer profession, choosing instead to focus on support (not just healing!) and letting every profession be good at it. That doesn't mean the professions are all the same though! While you can no longer have secondary professions as in Guild Wars 1 (which allowed you to use skills from a second profession in combination with those of your primary profession), the fact that each profession is now its own, yet so flexible at the same time have allowed ArenaNet to differentiate each profession, meaning that while each profession is good at dealing damage for example, they all go about it in very different ways. And that's before you take cross profession combos into account, which allow characters of different professions to create unique combinations of skills. For example, a warrior stomping while inside a smoke screen will cloak nearby allies. To top it off, when you run out of health you don't die immediatly but go into a downed state, where you get a last chance to fight and if you make a kill in that state, you're brought back to life. This also allows for more experimentation, because being defeated isn't that big a hindrance to your progress. Should you defeated again while you're in the downed state, you are killed and will either have to be resurrected by another player or choose to spawn at a way point for a small fee. 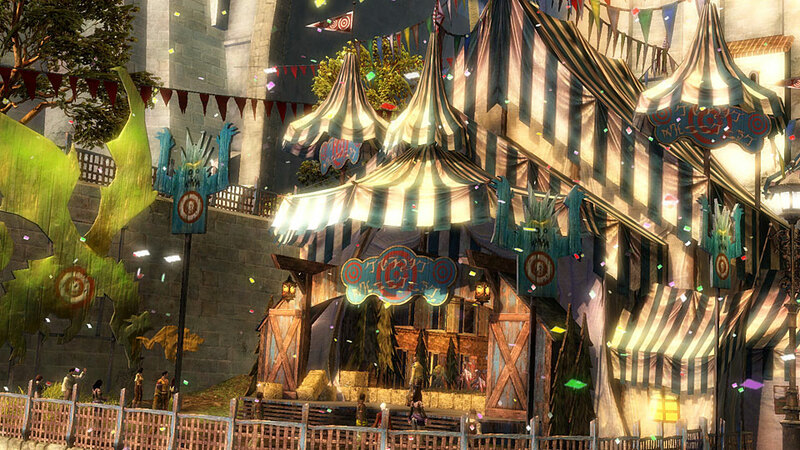 Now, the final key element ArenaNet is touting with Guild Wars 2 is the social aspect. You may think that socializing is something that is a natural part of any MMO, we have parties, raids, guilds and what have you after all. 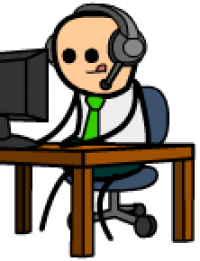 But it's not given, and traditional MMORPGs could easily be more socially oriented. 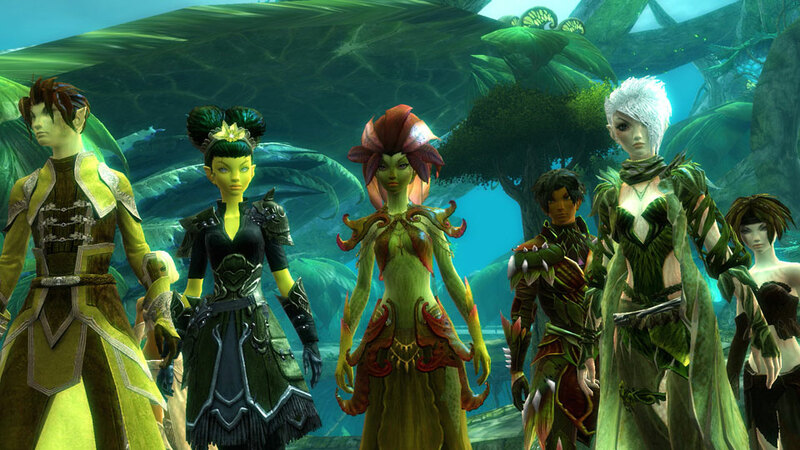 To become a more social MMO, Guild Wars 2 does a number of things. For one, you no longer have to be in the same party as another player to be rewarded for work you've both done. So if one player is killing mobs, you can join that player and help without stealing the kill, the XP or the loot. In fact, you're both rewarded at the same level as if you had defeated the mobs alone. You can't cheat though, for example by going to a dynamic event and not participating. If you do that, you are simply not rewarded anything. For dynamic events specifically though, there are actually three tiers of rewards that are used, depending on how much you've contributed. And, since anyone can join an ongoing event and help out, the dynamic events also scale in difficulty to keep things interesting. The next thing Guild Wars 2 does to let players socialize more easily is called sidekicking, which basically means the player can have their level adjusted to the content they're playing. 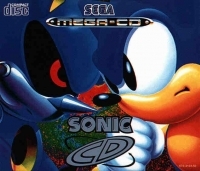 It works in both direction in that high level characters will have their level reduced when they play in lower level content, but a low level character needs a high level character to play with if they want their level sidekicked up. To make sure things stay balanced, the sidekicking only affects your attributes (and weapons when being levelled down). This means that a level 40 character kicked down to level 10 will be stronger than a character that is level 10 because they keep the skills, traits and items they've collected underway. All this helps make it easier for friends to play together as high level players joining a low level friend will find some challenge in low level content rather than just powering through it, and low level players can go exploring with their high level friends in areas they're not high enough level to deal with (though they still have to explore to get to these areas). This introduction has covered some of the key ideas in Guild Wars 2, but there's a lot more to talk about, so I hope you will keep on reading or jump straight to interacting with the VGChartz Guild Wars 2 community! Important: The requirements may change over time as changes are made to the game, so you may need to upgrade your system if you wish to continue playing after such a change. - Windows XP Service Pack 2 or better. - Intel Core 2 Duo 2.0 GHz, Core i3, AMD Athlon 64 X2 or better. - NVIDIA Geforce 7800, ATI Radeon X1800, Intel HD 3000 or better (256 MB of video RAM and shader model 3.0 or better). - 25 GB available HDD space. 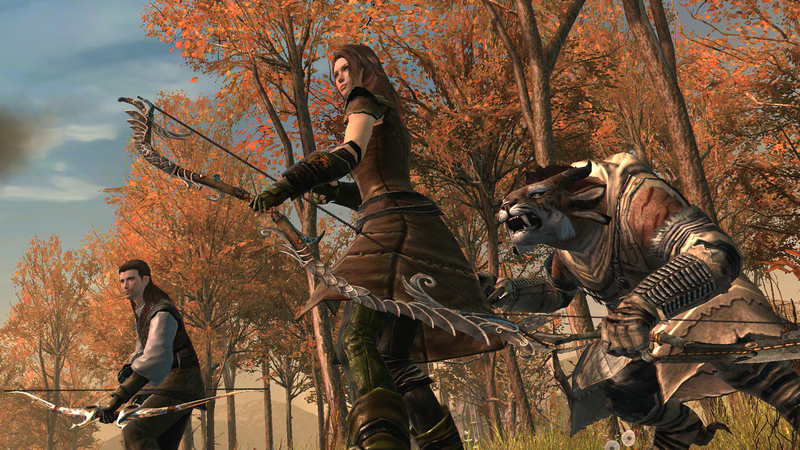 In Guild Wars 2, a lot of attention has gone into creating a good story. Few MMORPGs have a story on par with those of singleplayer RPGs, and ArenaNet are trying to do something about that. When you create a character in most modern MMOs, you're asked to provide appearances, race, class and name. Your "character" has no background beyond the one in your imagination. In Guild Wars 2, you will be asked questions to fill out some background information for your character. Where are you from, what's your social background, stuff like that. These will help define your character, your purpose in the world, how people react to you and your personal story as you play through it. Every character in Guild Wars 2 will have their own unique home. This is a small instance in your racial capital, that changes depending on the choices you make during the game. As you make new allies and lose old, join orders, and make other meaningful choices, you will see consequnces in your home instance, whether these are good or bad. You can invite players to your home, but you can only see other people's home by invitation. 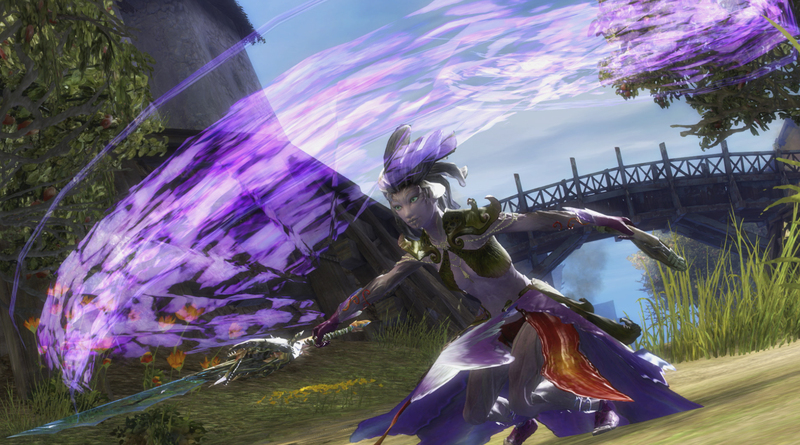 A lot of effort has gone into making the personal story in Guild Wars 2 truly personal. It will be shaped not just by the choices you make when you create your character, but by the choices you make throughout the storyline as well. You can therefor create several different characters who can experience very different stories. Currently, there are thousands of different story combinations to explore. Choice is not just about morale though, as many missions will offer tactical choice as well. Do you attack first thing at dawn, or do you sneak in under cover of nighfall? You can invite friends along to help out with the tasks in your personal story, but your friends' stories will not be affected by this. All the storycontent is also designed to be solofriendly, so you can go at it alone if you so choose. There will not be any material rewards that favor one choice over the other. So you'll never be faced with a choice, where there is a level 1337 "exploding firesword of fiery burning" on one end and a level 2 "splashy fish of water and digestion" on the other. Your personal story will also remain seperate from everything else, so no matter what happens in the dynamic events or whatever else can happen, your story will remain unaffected. And while you still can't recieve quests like you do in most MMOs these days (see the piece on the dynamic event system), you can recieve visits in your home instance from NPCs who would like your help. There will still not be any exclamation marks, but they will actually walk up to you and ask for your help. Personality refers to the behaviour of your character. 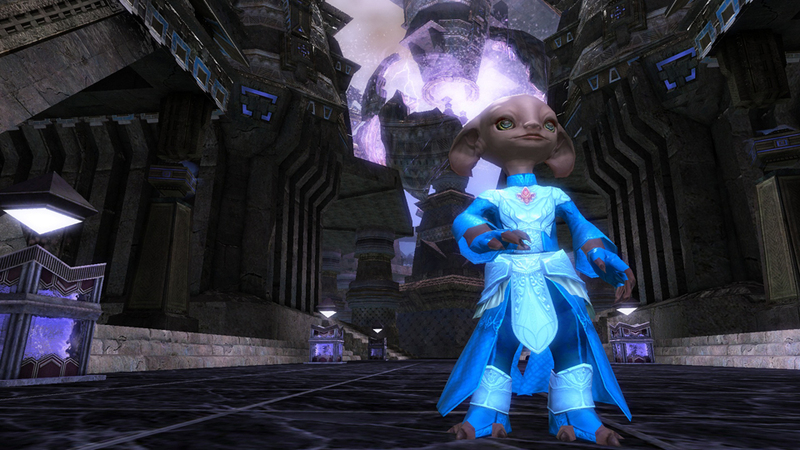 As you behave one way or another towards NPCs in the Guild Wars world, you'll be seen as a personality archetype. Maybe you're a badass character, who would rather threaten their way to help or goods, or maybe you're the gentle character who would rather inspire the NPCs to get the same results. The NPCs will then react according to the archetype you have about you. This is mostly cosmetic though, and its main purpose is to allow for greater immersion as players will have an easier time roleplaying and getting into their character. There will be rewards for certain interactions with the right personality, but these rewards can be obtained other ways as well, through buying for example. So far, we know what four of the eight professions in the game will be (elementalist, warrior, ranger and necromancer), and we know that there won't be any dedicated healer classes (so monks are out). Each profession can use many different weapons, and no matter what weapon you want to use, if your profession can use it, they can be effective with it. So if you want a warrior with a longbow, a necromancer that dualwields daggers or something else, these are perfectly viable choices. Finally, when you choose your class in the character creation, it's permanent and there are no longer any secondary professions. The elementalist is a caster that use the four elements (fire, air, earth and water) to damage their foes and protect their allies. Where other professions might switch weapons to adapt to new situations, the elementalist will attune to a different element. When an elementalist attune to an element, they will be actively wielding that element instead of their weapon. A fire attuned elementalist can deal out high damage with attacks that hit over a large area, like raining down meteors from the sky or setting the ground on fire. An elementalist will also automatically deal fire damage to any foe that touch her. An elementalist attuned to air will excel at dealing high damage to single targets by harnessing the lightning and wind, like sending lightning bolts after a foe. All foes in close vicinity to the elementalist will also be struck continuesly by lightning. The water attuned elementalist focuses more on controlling the battle and ensuring their party has the upper hand, like by freezing foes where they stand or creating slippery ice beneath them. Any allies close to the water attuned elementalist will also recieve continues healing. An earth attuned elementalist will focus on defense rather than offense, like turning their body into to stone for protection or knocking foes off their feet with earthquakes. Earth attunement also provides the elementalist with a higher defense. The elementalist have several types of skills they can use. - Glyphs boost the power of the elementalist, providing things like longer duration on spells, longer range, etc. For example, Glyph of Elemental Storage allows players to store a skill of their choice in their skillbar, so it can be accessed at any time, instead of disappearing when they change attunement. - Signets provide enhancements for the elementalist while equipped, but they can also be activated to provide a one time effect, like the Signet of Earth, which provide the elementalist with higher defence, but can be activated to send a wave of stone towards your foes. But the passive effect will not work while the signet is recharging. 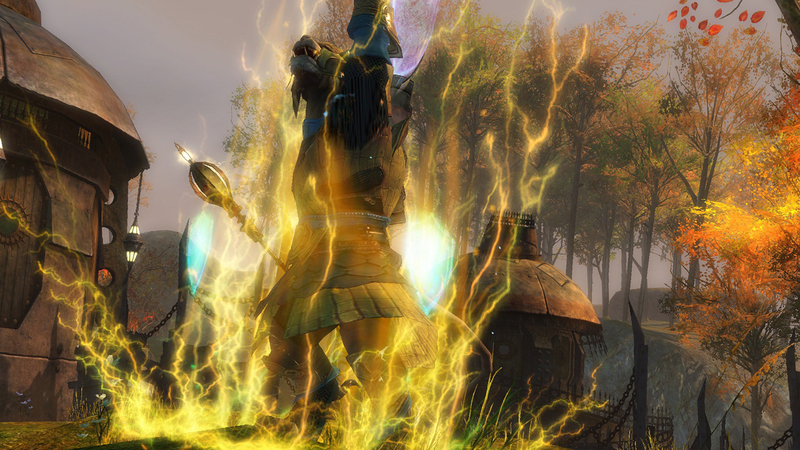 - Conjure spells allow the elementalist to conjure weapons to be used by both her and her allies. Conjure Frost will bring forward a bow any ally of the elementalist can pick and shoot arrows at their foes which will freeze them. - Area spells are spells that work over a large area, like sending out a cone of fire, or freezing an area so everyone who enters it are frozen to the ground. The elementalist has five different weapons to choose from. You can see that both the trolls (or whatever they are) are taking damage when without being hit by meteors, but they aren't actually knocked down until they are hit directly by a meteor! The Phoenix is sent out to the target and then returns to the caster, which allows for some strategy as the Phoenix will move with you (as seen in the video). It seems Water Trident both knocks down enemies as well as knocks them back. 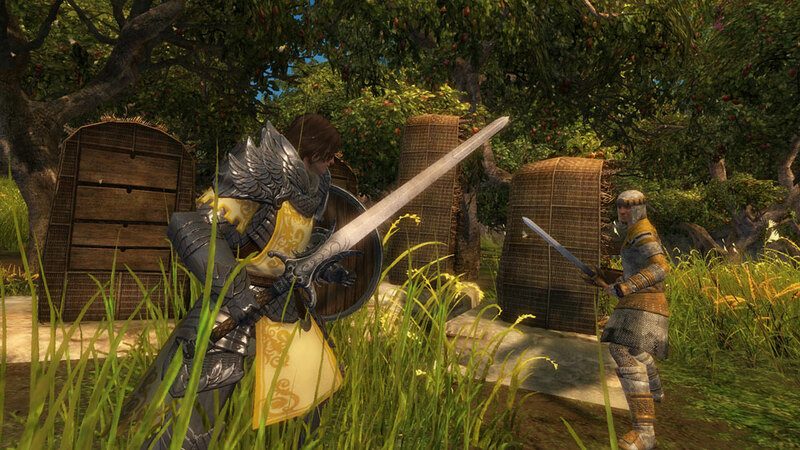 The warrior is a fighter who stays at the frontlines to dish out damage and absorb damage to protect their allies. The warrior has seven kinds of main weapons, that are useful for specific kinds of play. The swordwielding warrior is fast, and changes targets often, letting enemies bleed. The axewielding warrior quickly builds up adrenaline and is great for delivering big damage spikes. The hammerwielding warrior will pound foes to the ground, as well as stagger groups of enemies at a time. The macewielding warrior is great at stunning their foes, and leaving them open and vulnerable to further attacks. The greatswordwielding warrior use their large sword to deal with multiple enemies at a time, delivering attacks with a big area of effect. 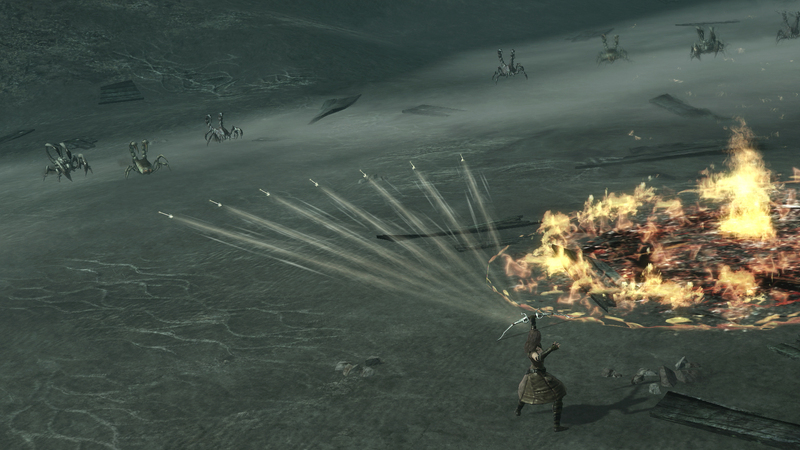 The longbowwielding warrior lights their arrows on fire to create attacks with a greater area of effect. The riflewielding warrior can easily pick off targets from afar, luring enemies in or finishing fleeing foes. The warrior has several special skills they can use. - Stances are skills which give you a continues enhancement at the cost of energy regeneration. Berserker's Stance will cut energy regeneration but give adrenaline regeneration for instance. - Chains are really three skills in one, that occupy a single skill slot. If you continue to hit your target, these three skills will be used automatically one by one as you hit your target. For example, the skills Sever Artery, Gash and Final Thrust are one chain, so you gain three attack skills at the slot cost of one. - Banners are buffs the warrior can call down to aid his party. This can be picked up and moved around or planted if you would rather have your hands free to fight. One example is the Banner of Courage, which increases the melee damage done by your allies. - Shouts can be used to give bonuses to allies or debuff enemies. The shout On My Mark will lower an enemy's armor and call it out to your party. - Charge skills are skills which can be powered up. The longer you prepare them, the more powerful they get, like the mace attack Obliterate, which has four different levels of damage. Furthermore, the warrior has nine different weapons to choose from. One-Handed: Axe, mace and sword. Two-Handed: Greatsword, hammer, longbow and rifle. Offhand: Axe, mace, shield, warhorn and sword. All in all, there are 19 different weapon combinations the warrior can use. The warrior uses adrenaline to fuel their fighting skills. Every attack they make builds up one strike of adrenaline, which goes towards the three levels of adrenaline the warrior can have. Every level of adrenaline gives an increasing bonus to the warrior's damage output, but the adrenaline can also be used to trigger burst skills. Every weapon has one burst skill, which will use all the warrior's stored adrenaline, and becomes better with each level of adrenaline filled at the time it is triggered. The improvement isn't necessarily related to damage, but can be about extending the life of inflicted conditions and the like as well. You can clearly see the range of the explosions from the markings on the ground. The ranger is a master ranged fighter and an acrobatic melee fighter who utilizes nature to help defeat his foes. The ranger always has a pet by his side as a trusty companion. Pets can be gained by charming juvenile animals in the wild, and the ranger can have three pets at any time, though only one of them can be out and active. There are many different animals that can be charmed, with 12 types in total. These types are for example terrestrial (spiders), amphibious (lizards) and aquatic (sharks), and then there are subtypes that can influence the pet's abilities. A polar bear might have an icy roar while a brown bear will have a fearsome roar. Pet's base level is determined by their owner, and with it, the pet's armor, health and damage. Pets have evolution levels on top of that. These are 20 levels where the pet will gain different bonuses as they level up, like health increases for example. They will also end up unlocking a total of four skill slots that they can have special skills slotted into. They will have eight skills available right from the start as they are charmed, but they can't equip more than they have room for. Aggressive: Attack targets around us. Defensive: Attack targets who attack us first. Stay: Stay in this position. - Traps: A trap is something the ranger can place where they stand. It will be activated once an enemy enters it, but only one trap of each kind can be used at a time, and the trap will remain active so long as the ranger stays nearby. 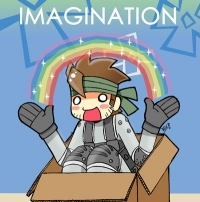 An example could be 'Spike Trap' which bleeds and cripples enemies who pass through it. - Spirits: Rangers can summon nature spirits which influence the area surrounding it. A spirit only stays out for a little while and goes away if the ranger wanders too far from it. Spirits can be attacked and removed by enemies, and a ranger can only one of each type of spirit out at a time. 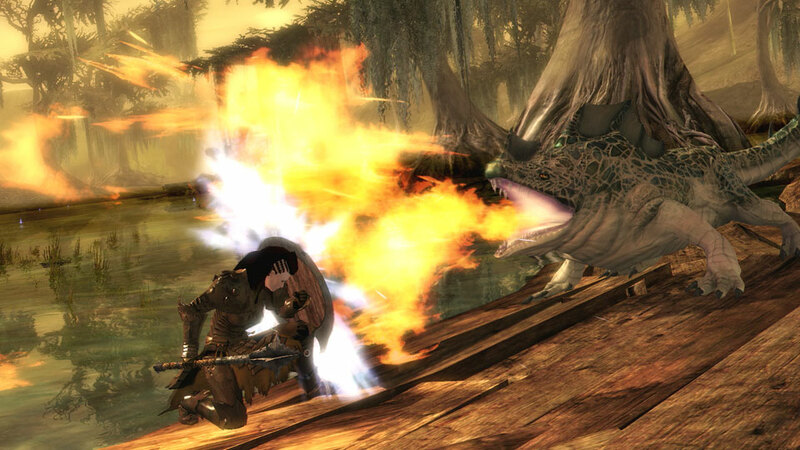 An example of a spirit is the 'Sun Spirit' which adds additional fire damage to allied attacks dealt within its reach. Two-Handed: Greatsword, longbow and shortbow. Offhand: Axe, dagger, torch and warhorn. It should be noted that the ranger wields an axe as a ranged weapon. This is the first skill we see for the warhorn. Notice how she uses what seems like a torch skill to light her arrows on fire. Here we also see what might be the first ranged dagger attack we've seen. The necromancer is a magic user that feeds on the life force of his enemies and commands the dead. By attacking and killing enemies, the necromancer gains life force, which he can use to go into his Death Shroud form. And where other classes will go into a downed state when they face defeat, the necromancer goes into Death Shroud instead. - Wells are used to create an effect in the area around the necromancer. Well of Blood gives nearby allies some health regeneration for example. Only one well can be active at a time. - Minions are creatures the necromancer can summon. Minions no longer require corpses to be summoned from, and every minion summoning spell has a secondary spell associated with it. When a summoning spell is used, it is replaced with the secondary spell for as long as the minion is alive. For example, when Summon Blood Fiend is used, a blood fiend is summoned, and Summon Blood Fiend is replaced with Taste of Death. Taste of Death allows the necromancer to destroy the minion and heal himself by doing so. - Marks are ground targetted spells the necromancer can cast. Mark of Blood will give nearby allies added health regeneration and damages enemies for example. All marks trigger after a set time, but they can be triggered manually by the necromancer as well. There can only be one mark cast by the same skill at one time, so the maximum amount of marks you can use is dictated by how many marks you have in your skill bar. - Fear is a condition only the necromancer can put on his enemies. Fear makes an enemy flee from the necromancer for a short period of time, for instance, casting Doom on an enemy will give it fear. The necromancer have these weapons to choose from. One-Handed: Axe, dagger and scepter. Offhand: Dagger, focus and warhorn. Life force is unique to the necromancer, and is something they can gain in various ways, like whenever a kill happens nearby or through certain skills. For example, Ghost Armor increases the necromancer's armor and gives him life force whenever he takes damage. Life force is used to power up Death Shroud, which is the only thing that actively uses life force. Death Shroud is a special form that is available to necromancers. When they enter Death Shroud, their life force becomes their health bar, and when it reaches zero, they go back into their human form. However, necromancers also enter Death Shroud instead of going into a downed state, as other professions would. The necromancer will here return to their human form when he makes a kill, or go down completely when his life force reaches zero. The special abilities available in Death Shroud can't be changed, although they can be altered by using traits. Once again, ArenaNet have given us a few videos so we can see a few necromancer skills in action. Here we see that cripple and knockdown are also returning from the first games. This trailer presents a basic overview of the five playbale races in Guild Wars 2 (sylvari, norn, charr, asura and human). The sylvari are a young race, they are only 25 years old. They hail from the Pale Tree, a tree planted in the Maguuma Jungle hundreds of years ago. As the tree grew and expanded its reach into the jungle over the centuries, the tree finally bloomed 25 years ago, giving birth to the sylvari Firstborn and followed by season after season of new sylvari, all of whom feel a deep connection to everything that grows and blossoms, it is their brethren. The sylvari were shaped by the Dream in the Pale Tree, and the Dream lingers in all sylvari like an echo of a song that flows through all sylvari. It allows them them to share their experiences, knowledge and emotions, so the sylvari travel the world in search of adventure but without a true purpose, balancing curiosity with duty; eagerness with chivalry; and warfare with honor as best as they can. The sylvari guide their lives by the lessons carved into the sacred Ventari Tablet, living in their capital where they have created a culture combining the mystery of magic and a determination to do good in the world. 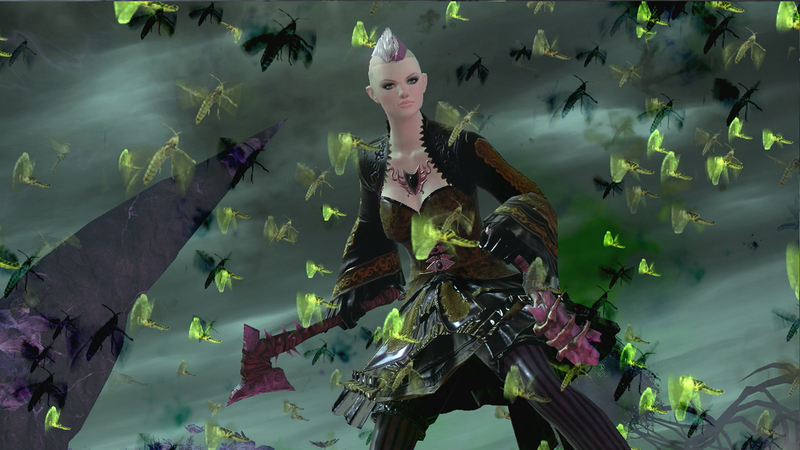 But not all sylvari live this way. Members of the Nightmare Court are sylvari who follow a path of shadows and nightmare, seeking to taint the Dream and the Pale Tree and trying to draw their brethren into their corrupt ways. I just hope we don't have to grind like that grind fest Aion. 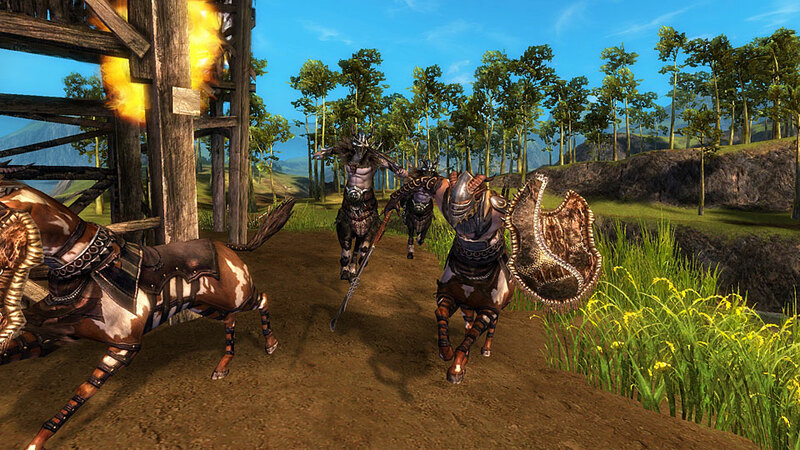 Guild Wars is generally a game where you don't have to grind, as it is all about the players own skill and tactics. I'm sure the same will be true for Guild Wars 2.